This is a highly sought after Gong ting shou Pu-erh minin beeng cha from the Langhe Tea Factory. This relatively new tea factory has earned an excellent reputation for their recipes for fine, long-keeping shu Pu-erh. 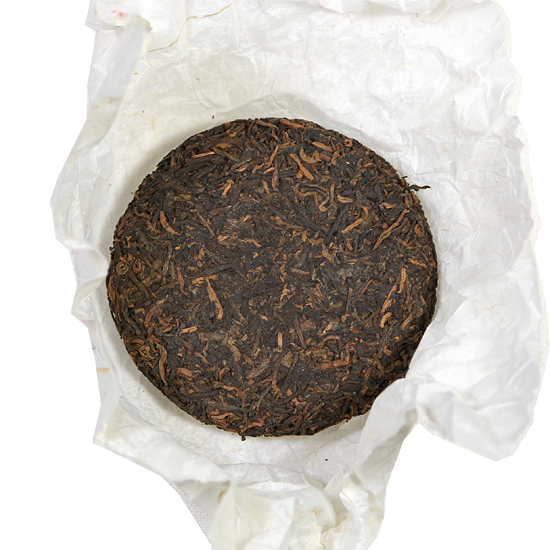 Langhe’s Gong ting Pu-erh is very rich and naturally sweet – it is a very high grade of tea that is comprised mostly of buds: sweet, tender buds. Gong ting buds are small in size and we are thrilled to discover a mini shou beeng cha that highlights these buds and that is so skillfully made. Because the buds are small and tender, the fermentation in the tea factory is carried out for a shorter amount of time than it would be if the leaf materials being used were large and coarse. This shorter time yields a sweeter, milder tea with none of the wo dui (musty, funky) smell that some shou Pu-erh beeng cha have. This tea is from 2008 so it already has some age to it. So it provides quite lovely drinking now. But the cake will continue to age gracefully and become a treasure in your tea chest in years to come. We recommend purchasing one or two now. The aroma if the beeng cha is light and sweet and very clean. The taste is rich in the way that mushrooms, fine wine and old Port are rich. The taste is harmonious and well-balanced and very satisfying.